We proudly serve Greenville, Spartanburg, Anderson, Simpsonville, Easley, Taylors and all surrounding areas. For a limited time GET 10% OFF! when you schedule online for your free In-Home Consultation. Professional bath remodeling in Greenville for new showers, tubs and more. We provide affordable Greenville bathroom remodeling solutions and a detailed quote for your consideration in the comfort of your home. Serving: Greenville and all surrounding areas. Do you feel your bathroom is boring? You do not need to worry about it anymore. Five Star Bath Solutions of Greenville provides you with the best quality bathroom amenities and fixtures. You can call our friendly staff or submit the online form on our contact page. Calling us will bring you closer to getting your dream bathroom. On receiving your request, our representative will arrange a convenient meeting at your house. This meeting will be free of cost, with no obligation or pressure from the estimator. As per the scheduled meeting, our friendly estimator will come to your home. They will listen to your desires and requirements for your bathroom. They will then offer more ideas and a variety of options for you to choose from. Finally, they will take some measurements of your bathroom and work out a budget plan. The budget plan will tell you the cost of the renovation. On the basis of the provided budget, you decide whether you need to move on further with the process or not. On agreeing to the budget, our team will schedule a time that is convenient for you. Our professional installers will come to your home with all the necessary tools to renovate your bathroom. Our team is proactive. They arrive with all the back-up supplies and tools to deal with any surprises. Your new bathroom will take the shape of the dream bathroom in the specified time. Five Star Bath Solutions is considered a one-stop shop for your desired bathroom renovations. We have been serving for over 18 years in 30 different locations across North America. Our reasonable prices are structured for any size bathroom renovation. Even with our fantastic prices, we will not compromise on the quality of our services. Our team includes professionals and knowledgeable experts to provide you with the best bathroom remodeling. Contact us online now to get your free estimate. Take advantage of our free, in-home consultations and estimates today. Call us at (864) 516-8584! Renovating your bathroom may stress you out as it requires plenty of time and effort. But Five Star Bath Solutions will save you from all the stress and hassle. We are experts in our field; hence, we can complete the renovation in the set time. We can transform your ordinary, dull bathroom into the one that you’ve dreamed of. Every customer desires to get a complete package. Five Star Bath Solutions has the best installers along with friendly customer services. We strive to provide complete satisfaction to our customers. As a result, we make honest, sincere, and friendly relationships with them. Our craftsmen go through the process of evaluation and screening. This ensures their skill and professionalism. Our craftsmen are knowledgeable and professional and provide you with the work of your choice. All estimators on our team are experts at providing consultation. We guarantee to send an expert estimator to discuss your bathroom’s transformation. Our estimators are experienced and they have relevant knowledge and expertise. Additionally, they can provide you with a variety of ideas to make your bathroom look exquisite. We have a wide variety of over 9,000 bathroom fixtures. We can help you with various options in selecting the design and style of your choice. After depicting the image of the bathroom, the estimator will create a price quote. They will keep in mind your preferences and budget. For Five Star Bath Solutions of Greenville your needs comes first, and are our topmost priority. We are not pushy about selling our services; we sell you what you prefer and need. You wouldn't want an unprofessional installer to renovate your bathroom. To keep our standards up to the mark, we screen all our installers' backgrounds. Installers at Five Star Bath Solutions undergo a thorough testing process. They are required to do factory installation specifications on every job. Depending on the quality and finesse in the work, we judge the capability of the installer. We then hire only the best of the best. Thus, you can rely on us for your dream bathroom. You just need to make a call to (864) 516-8584. Our friendly staff is waiting to answer your call and all the questions you may have. You can schedule an appointment with the estimator and get your quote right away. Five Star Bath Solutions is the only bathroom renovator you should rely on for all your bathroom remodeling projects. We promise to serve your interests at a fair price. Take advantage of our free, free, in-home consultations and estimates today. Call us at (864) 516-8584! Five Star Bath Solutions of Greenville offers you economic and top-notch quality bathroom amenities. We aim to please you with our variety of 9,000 fixtures. We deal with all types and all sizes of bathroom renovations. From showers and tubs to flooring, or a complete bathroom renovation. We send our skilled installers even for any minor modifications. We do not compromise on the quality of our services. We value your trust, and for that reason, we focus on absolute excellence. Give us a call now at (864) 516-8584 to schedule a free, in-home estimate. We value your preferences. This is the core factor which separates us from our competitors. We do not hard sell our products to you. Instead we learn what you need and offer you a selection of solutions to choose from. Additionally, we also provide guidance and honest opinions on any bathroom fixture you choose. We value all our customers and offer them top notch quality products. Furthermore, our success lies in providing customers with the best skilled installers and craftsmen. Moreover, our satisfied clients give us positive feedback and reviews. Our customers' satisfaction is important to us. Making you happy with our services is one of our prime objectives. Five Star Hotel Quality Bathroom! If you have seen bathrooms at a five star hotel, then you know how beautiful they are. Do you want your bathroom to look like that? If the old, dull and boring look of your bathroom is making you unhappy, then call us now at (864) 516-8584. We will help you transform your bathroom to look and feel more like a five star hotel. You deserve to freshen-up in a calm and beautiful environment when you get back home from a busy, tiring day at work. Our variety of bathroom equipment and fixtures will astonish you. To install modern amenities in your bathroom, you may call us now. We can help you get the feel of a luxurious bathroom at a favorable price. Our representatives are available to serve you. We will schedule a convenient time for you to have our estimator meet with you. Our estimator will come and discuss all the details with you. He will then set up a budget friendly estimate outlining all the costs of the bathroom renovation. Your budget limit and design preferences will drive the estimate process. Are you sick of the old-fashioned shower? Revitalize your bathroom with Five Star Bath Solutions in Greenville. We offer a fair price and will help you get the feel of a luxurious bathroom. Once you experience our superior quality of work and craftsmanship, you will recommend us to your friends. We transform bathrooms of any size and type. We deal with any type of bathroom-related issue, be it a major or minor one. We have over 9,000 varieties of bathroom products to cater to your style and desires from classic to modern. We aim to please you by adding new style and variations in your bathroom. Five Star Bath Solutions offers you a complete package of services. These include innovative bathroom appliances, friendly services and skilled installers. We at Five Star Bath Solutions are highly rated and have a solid reputation in the industry. We also offer our customers top-quality products. We offer various services including complete bathroom transformations and installation of stylish bathroom amenities. Do slippery tubs frighten you? We have a modern bathtub solution for you. Our new walk-in bathtubs provide you with ease, security, and peace of mind. Walk-in bathtubs will make your life simpler than before. Give us a call now at (864) 516-8584 to get all the required details on our walk-in bathtub. 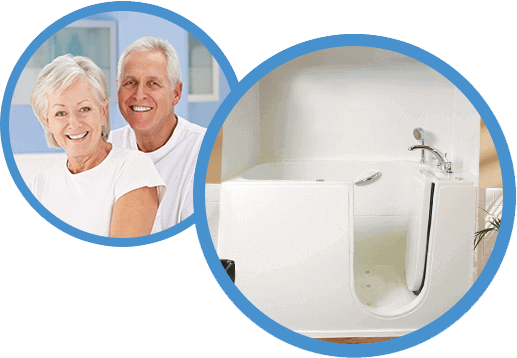 Our team will help you in choosing the best walk-in bathtub for your needs. Our walk-in bathtub has a patented design and can be easily transported through your home for installation. It can fit into your old bathtub’s location. If the space is too big for your new tub, the included kit will fill in the extra space beautifully. The walk-in bathtub has a beautiful appearance which will enhance your bathroom’s appeal. A walk-in bathtub has many benefits such as easing muscle pain and reducing stress levels. This tub can give you back your sense of security and bathing independence. Plus, it's super comfortable to take a bath in. Additionally, the walk-in tub has an option of 13 high performance jets. It also has three settings along with a hydrotherapy system. Additional features are arthritis friendly faucet handles and a convenient handheld shower head. This tub drains ten times faster, so you can get out of the tub quicker when you are finished bathing. Five Star Bath Solutions can remodel your bathroom in as short a time as one day. Shower and bathtubs are a critical part of your home and daily life. Contact us online today to get your free estimate. Five Star Bath Solutions is the number one bathroom renovation company in Greenville. We have served our clients for 18 years in 30 different areas across North America. We offer 9,000 modern bathroom amenities in our catalog. Over the years, we have served our customers with a strong commitment and have provided them with unique bathroom ideas. Our customers understand the quality Five Star Bath Solutions of Greenville offers. We have a network of local specialists who provide bathroom remodeling services to local clients. We can give you a luxurious bathroom. We also have modern bathroom amenities with fine detailing and finishing. If you wish to install new bathroom features, you have come to the right place. We at Five Star Bath Solutions know how to please our customers with our excellent bathroom renovation experience. We have the keys to make your bathroom beautiful. Our variety helps you choose the right fixtures for your preferences and budget. To get modern bathroom amenities installed and to learn about all the related details, call us at (864) 516-8584. Located in foothills of The Blue Ridge Mountains lies the city of Greenville. According to the 2013 census report, the city is home to 61,397 people. Greenville is also the seat of government of the Greenville County. The city includes the following neighborhoods: Alta Vista, Augusta Road, Berea, Cleveland Park, Glendale Heights, Gower Estates, Greer, East Park, Hampton Pinckney, Heritage, Nicholtown, North Mian, Overbrook, Parkins Mill, Sans Souci, Shoals Crossing, St. Mark, Taylors, West End, West Greenville. The Greenville metropolitan area is the largest metropolitan area of South Carolina. It not only covers Greenville but also encompasses Mauldin and Anderson. The metro area has a population of 850,956, which makes it the most populous in the state. It is also the fastest growing area in the state. Greenville is surrounded by many towns that only add to the beauty of the region. One example is the City of Travelers Rest, located to the northwest of Greenville. The City of Greer is another historic area near to Greenville. It has wonderful architecture that attracts many visitors. The City of Mauldin has various biking trails and cultural centers. Greenville provides many recreational opportunities for its residents. It has 13 golf courses and more than a hundred venues for tennis. The beautiful terrain also makes it a great place for hikers. The city has 39 parks that occupy more than 400 acres of land. There is also the Greenville Zoo, providing opportunities to enjoy and learn. The zoo also hosts birthday parties and a scout program for all ages. Bergamo, Italy, is the sister city of Greenville. The beautiful city of Bergamo is located in east of Milan. It is situated at the foot of the Alps and has a population of 140,000. This historical city of Venetian walls have many historical and artistic sites. Greenville's relation with this city goes back to 1984. The interactions were made possible by the Radicci family. The Radicci are a prominent family of Bergamo industrialists. Funding was also endowed by various other officials of Bergamo. They were keen to have an association with Greenville. This bond between Greenville and Bergamo has proved to be beneficial for both cities. Serving: We serve Greenville, Spartanburg, Anderson, Simpsonville, Easley, and Taylors and all surrounding areas.